>You Are Here. Jump to other pages. 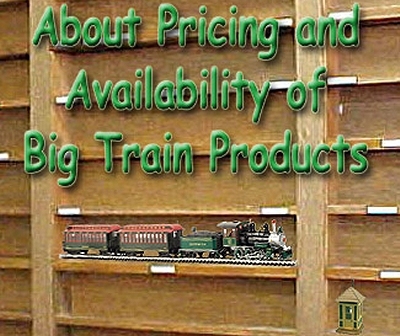 Note: Family Garden Trains™, Garden Train Store™, Big Christmas Trains™, BIG Indoor Trains™, BIG Train Store™, and Trains-N-Towns™ are trademarks of Breakthrough Communications (www.btcomm.com). All information, data, text, and illustrations on this web site are Copyright (c) 1999, 2000, 2001, 2002, 2003, 2004, 2005, 2006, 2007, 2008, 2009, 2010, 2011, 2012, 2014, 2014, 2015 by Paul D. Race. Reuse or republication without prior written permission is specifically prohibited. Big Christmas Trains(tm) is a participant in the Amazon Services LLC Associates Program, an affiliate advertising program designed to provide a means for sites to earn advertising fees by advertising and linking to amazon.com.